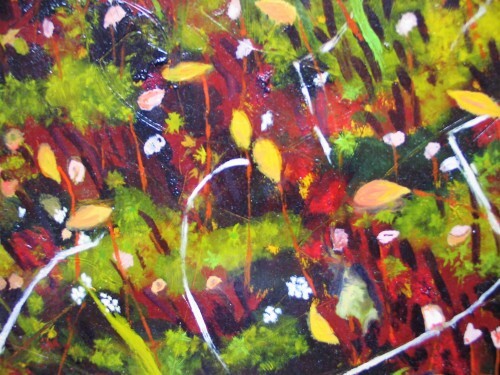 In my most recent work I have been looking at the landscape in varying degrees of focus. 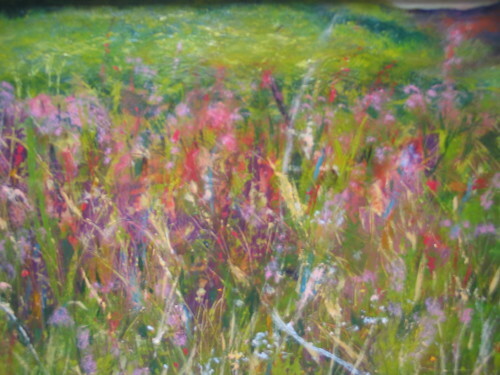 While I am still attracted by the drama of distant views and the colours and atmosphere created by the playing of light on water and the hills, I am becoming increasingly drawn to the minutiae of vegetation, its intricacy and the sparks of colour which occur in meadow, bog or on the hill. I am enjoying making work based on research carried out on Tanera Mor, the largest of the Summer Isles. This follows my series of mixed media paintings 'Frozen River'. That series stems from a walk I took in January 2016 in freezing conditions around Ullapool. The Ullapool River had frozen over in places creating the most beautiful ice patterns. I was particularly interested in looking at the different layers of the river: the stones and running water beneath the surface of the ice, the ice itself, and the stones above its surface. Using mixed media - oil pastels, acrylic paint and candlewax - I built up the surface of the work in different layers to echo the layering of the subject matter. Pools of acrylic paint dry with jewel-like intensity and the resist quality of candlewax when over-painted adds a textural element which I find irresistable. I am now exploring the landscape using mixed media, collaged collagraph, and oil on gessoed boards. 2010 Gallery at McNaughtan's, Edinburgh.